Sure, the smell of your last meal can linger around your house–for better or worse–but it can also change your smell. What causes body odor? Not sweat itself, which has no scent–it’s basically water and electrolytes. Instead, B.O. comes from a sort of chemical reaction. Most normal body odors are the interaction of skin bacteria with secretions in the area. Food might alter this smell because certain byproducts get secreted as our bodies break down what we eat, then react with the bacteria on our skin. There’s not a huge amount of scientific evidence pointing to which foods are the worst offenders, but there’s enough anecdotal evidence to give us a sense of what kinds of foods find their way into our body odor. You already avoid garlic before a date or a job interview. But here’s an experiment to demonstrate why: Rub crushed garlic on your feet (yes, your feet) then wait. Within half an hour or so, you can taste the garlic in your mouth. The chemicals get absorbed into your bloodstream and then into your lungs. Then they come out your breath, urine, and, you guessed it, sweat. Chewing or even just cutting garlic unleashes enzymes that break down into a sequence of compounds to eventually form allicin. Allicin is broken down in the body into the sulfur-containing compounds that cause that lingering stink. A quick fix for garlic breath? According to one study, drinking milk, either before or after eating garlic, can help restore freshness. 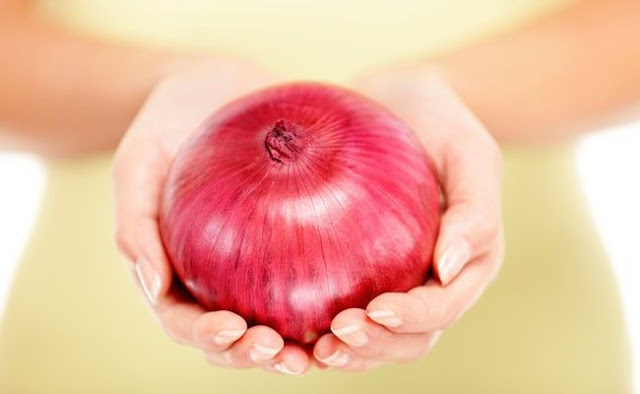 Eating onions is equally ill advised if you want to make a good first impression, and for the same reason as garlic: Onions also break down into sulfur compounds. Many of these volatile sulfur compounds have a high odor impact and can be detected at very low concentrations. In other words, a little goes a very long way. It’s sometimes hard to distinguish between garlic or onion breath and garlic or onion body odor. Cabbage, bok choy, broccoli, and Brussels sprouts–among other cruciferous produce–also contain ample amounts of sulfur. A lot of the evidence for cruciferous vegetables contributing to body odor (through your breath, sweat, or flatulence) is anecdotal, adds Smith. Regardless, there’s a strong argument for eating these foods anyway. They have a lot of fiber and contain plenty of beta-carotene along with vitamins C, E, and K as well as folate. In addition to being good for general health, there’s some evidence they may also help prevent certain types of cancer. Here’s another reason to limit the amount of meat, especially red meat, you ingest–particularly if you’re a man looking for love. In a small study, researchers randomized a group of 17 guys to either eat meat or abstain for two weeks. Then they switched groups. Women analyzed body odor from the men's armpits at the end of each session, saying that the body odor of the men when on vegetarian diets was “more attractive, more pleasant, and less intense. Certainly excess amounts of alcohol can be detected on your breath, hence the roadside breath tests that can tell if you’re over the legal driving limit or not. What you may not know is that alcohol can also emanate off your skin. The alcohol is metabolized in the liver and broken into acetaldehyde that goes through your lungs into your breath, but it also gets to the pores. One or two glasses of wine probably isn’t going to make you reek, but a few too many (not good for your health anyway!) could. “It’s dose-dependent and individually based. Fish certainly carry their own pungent aroma, at least when they’re out of the water. But can they alter body odor in humans? Apparently so, at least in people who have a genetic disorder called trimethylaminuria. These are inborn errors of metabolism where people can’t break down certain types of protein, including an amino acid called trimethylamine, which is produced in the intestines when the body digests foods like fish and eggs. As trimethylamine builds up, it “gets into your urine. You can smell it on your breath and also in your sweat as well. The smell can be a fishy one, but some have also described it as smelling like rotting fish, rotting eggs, urine, or garbage. Asparagus doesn’t contribute to body odor so much as it alters how your urine smells after you eat it. Most everyone produces the stinky chemicals that are excreted in urine as their bodies break down asparagus, but interestingly, not everybody can smell the resulting odor. Some people just can’t smell it. About 8% of people don’t produce the offending odor and 6% can’t smell it. What smells the difference? Just like so many other things, genetics.